In the summer of 1972, as the Kennedy Institute of Ethics was still in its nascent stage and scholars were coming together to explore the relatively new concept of “bioethics,” an idea was forming that would help define what “bioethics” would be going forward. With such an interdisciplinary field, there was a great deal of discussions of how far bioethics went beyond simply medical ethics. The scholars of the field, of course, had many differing opinions, but one thing was certain: bioethics needed to extend beyond the physician and patient and look into the value judgments, the moral and social implications, and even places outside the medical and health professions. Of course, as we know, bioethics grew well outside of even that expansive definition, but in the 1970’s simply exploring the above seemed like an insurmountable task. Knowing the difficulty in tackling such an endeavor an idea was formed to create a compendium of knowledge that would be a base by which others could start their study of the issues and give those who were already deeply embedded within a chance to explore views outside of their chosen field. In addition, the compendium would look outside of the typical ethical fields of religion and philosophy to engage practitioners, scholars from social and behavioral sciences, legal scholars, with the law becoming as important, if not more so, than the ethical considerations to help create the volumes. Also important was that this new knowledge base not excludes perspectives from outside the western world. It needed to be an international source of information to properly fit the needs of the field. It also needed to look out beyond the concerns of the individual human to a broad range of life as the competing interest of humans, animals, and the biosphere held deeply moral issues that were too inter-meshed to ignore. Environmental science, social and political issues like access to natural resources, the rights of animals were all needed as part of this larger compendium of knowledge. 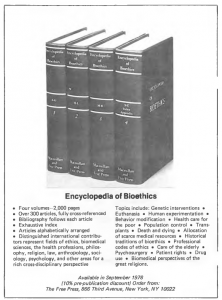 With the above goals and the knowledge that something like it was sorely needed it wasn’t too long before the Encyclopedia of Bioethics was born. Originally projected to be published in 1976 it actually took until 1978 for the full four set volume to be released. With nearly 2,000 pages of texts and hundreds of written articles, you can understand why! Though it took a few more years than anticipated the goals of the project stayed the same throughout. The historical value of the 1st edition of the Encyclopedia of Bioethics cannot be over exaggerated. In fact, stated within the introduction of the first volume there is a concern that the material will already be outdated by the time it gets into the hands of readers and scholars alike. So fast was the field of bioethics growing and evolving that the editors knew they could not cover everything in the detail, thus they understood that what was being written was to help create a “snapshot” of the literature and analysis of the day and not any sort of “freezing” of knowledge to never be changed or reexamined. For those interested in the evolution of bioethics, these “snapshots” provide an amazing resource to compare and contrast with what is being considered today. Currently in its 4th edition, the Encyclopedia of Bioethics has become a bedrock source for students, scholars, and anyone who works in a field touched by bioethics. It is convenient and, more importantly, relevant synthesis of information to not only inform, but create questions to be addressed by the reader. 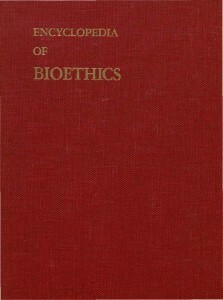 The Bioethics Research Library as part of our ongoing preservation effort has fully digitized this first edition of the Encyclopedia of Bioethics. With the understanding of how important the information was and knowing that the original texts were reaching nearly 40 years of age, it was determined that a digitization project was required. Using the library’s own copy, each individual page was scanned using a high-resolution overhead scanner and preserved as a digital file that could be used in the future to create additional digital files when needed. A derivative access file was created from these high-resolution images to create a copy to be accessed by our patrons. To make the information more easily accessible by the Georgetown Community these digital reproductions are fully text searchable and are being hosted in our digital repository hosted over at Digital Georgetown. Currently, you must be a member of the Georgetown Community to access these files. By accessing these reproductions, you help the library keep and maintain our physical volumes for future students and scholars. The physical volumes are held on campus, along with the other editions of the Encyclopedia of Bioethics, and patrons who are interested in viewing the physical volumes should contact the Library before visiting.